If you have arrived from Clare's blog, welcome! 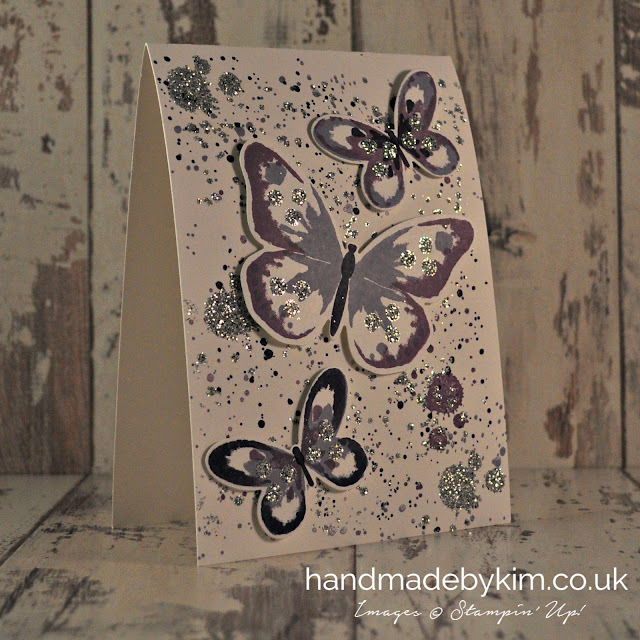 I am so happy to be sharing my Sparkling Watercolor Wings Butterfly card that I've created for you. I made a similar card a few weeks ago but I decided to step up the design by adding more details to the background and adding some much needed sparkle. To make the background I used the Gorgeous Grunge stamp set. I started by stamping the splatter effect using Elegant Eggplant, Perfect Plum & Wisteria Wonder ink. Using the same stamps I then used Versa Mark ink to stamp more splatter effects. Next I sprinkled Heat & Stick powder over the Versa Mark ink, tapped off the excess, then used the Heat Tool to make the powder tacky. I then sprinkled Silver Stampin' Glitter over the spots (again, tapping off the excess) and used the Heat Tool to set the glitter in place. 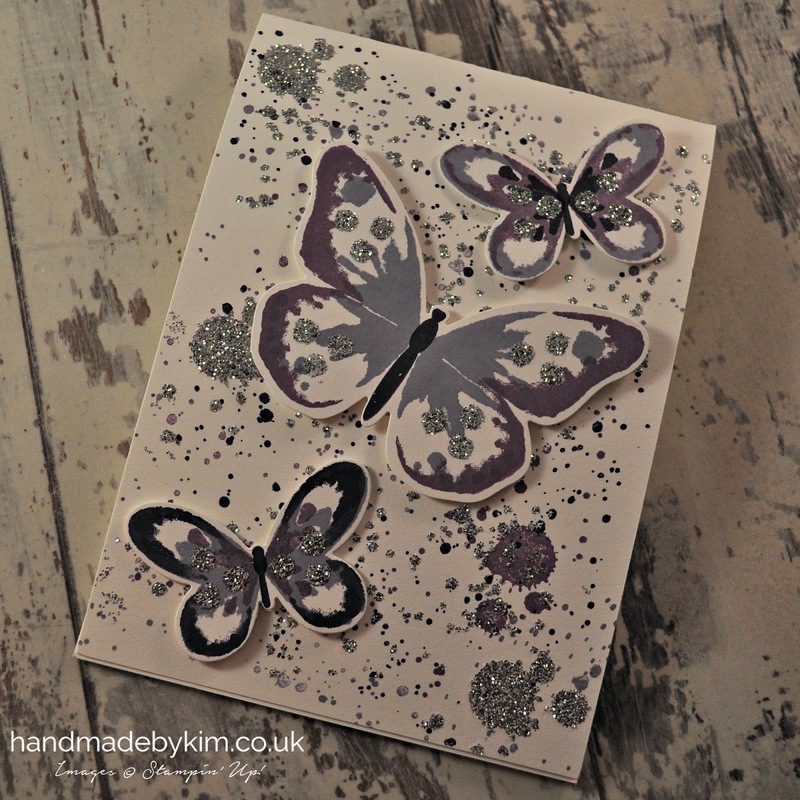 For the butterflies I used combinations of Elegant Eggplant, Perfect Plum & Wisteria Wonder ink using the Watercolor Wings Stamp Set. You can buy this stamp set as part of a bundle including the Bold Butterflies Framelit Dies. When you buy a bundle you save 15% of the combined price. 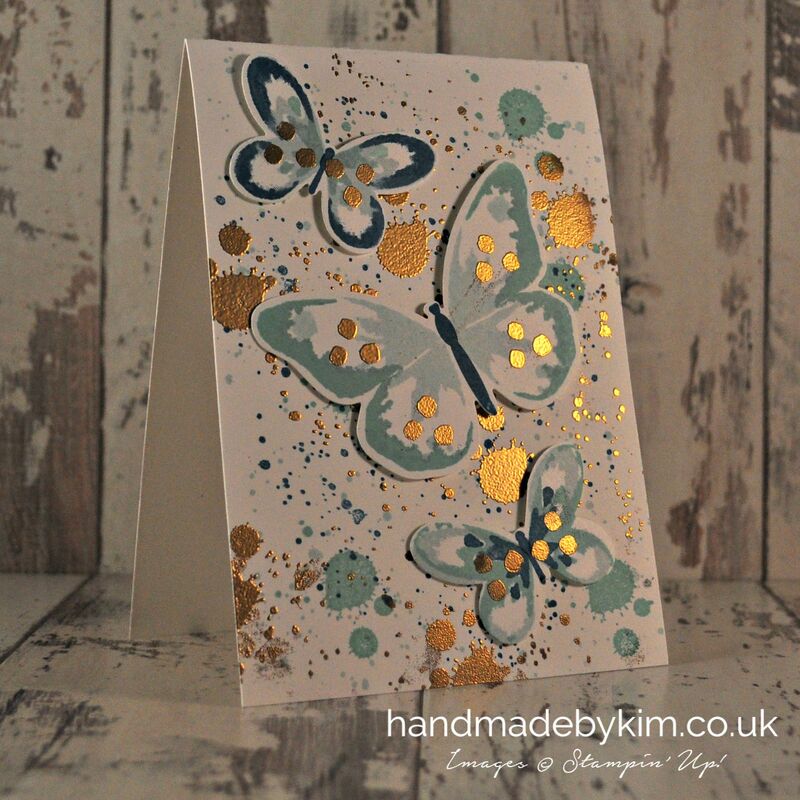 For this project I used the both the Bold Butterfly Framelits Dies and Butterflies Thinlit Dies to die cut the small and large butterflies. It was so simple and quick and by using these dies, its gives my finished card a more professional look. 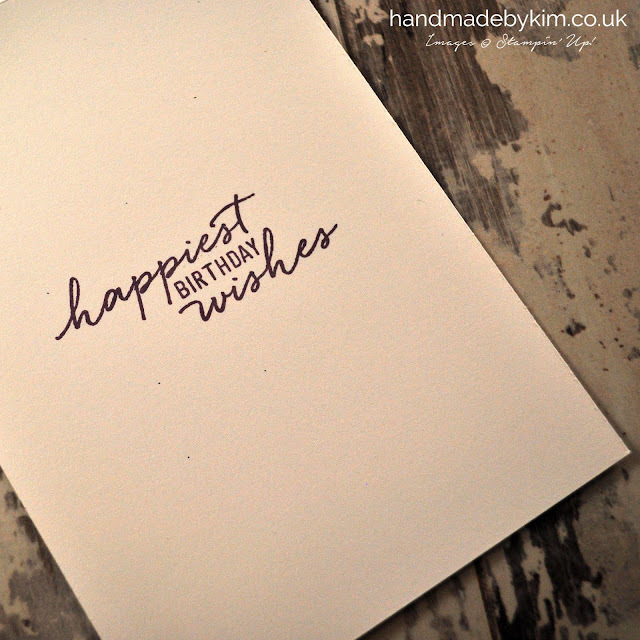 For the inside of the card I used the the stamp set included within the Watercolor Wishes kit. I stamped the sentiment Happiest Birthday Wishes using Elegant Eggplant ink. I chose this stamp as I love the font but you can use any stamp set and sentiment of your choice. Initially I couldn't decide whether to use Heat & Stick Powder & Stampin' Glitter or just Stampin' Emboss Powder. This version has been made using Island Indigo, Pool Party & Soft Sky ink and Gold Stampin' Emboss Powder. The effect is not as glittery as my featured project but still has a beautiful shine when you catch it in the light. I hope you enjoyed looking at my projects today, please leave a comment to let me know you stopped by and click here to subscribe for craft project ideas and inspiration 3 times a week on Mondays, Wednesdays & Saturdays. Next up we have Tracy who has created a lovely card for you today..... thank you for taking the time to look at the wonderful cards the Pinkies team have created for you on World Card Making Day 2015!